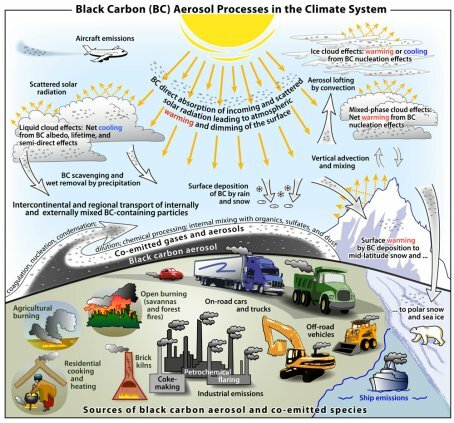 Aerosols have a strong impact on climate, in particular sulfur dioxide and black carbon. 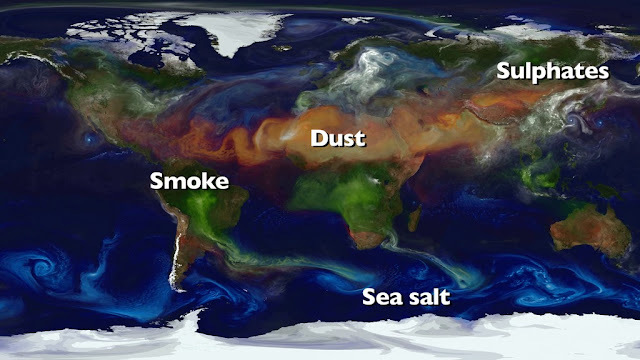 As above image shows, aerosols result from burning fuel in industrial processes and transport, and for purposes of heating or lighting buildings (such as with woodburners, furnaces, stoves, candles, oil lamps and open fireplaces) or for preparing food and boiling water. Aerosols can also be caused by open fires that can be lit to make charcoal, burn waste, turn forests into pasture, etc. Global warming increases the fire danger (i.e. in frequency, intensity, duration and size) and thus emissions from both forest fires and controlled open fires (backburning and reducing waste). A 2008 study by Ramanathan et al. 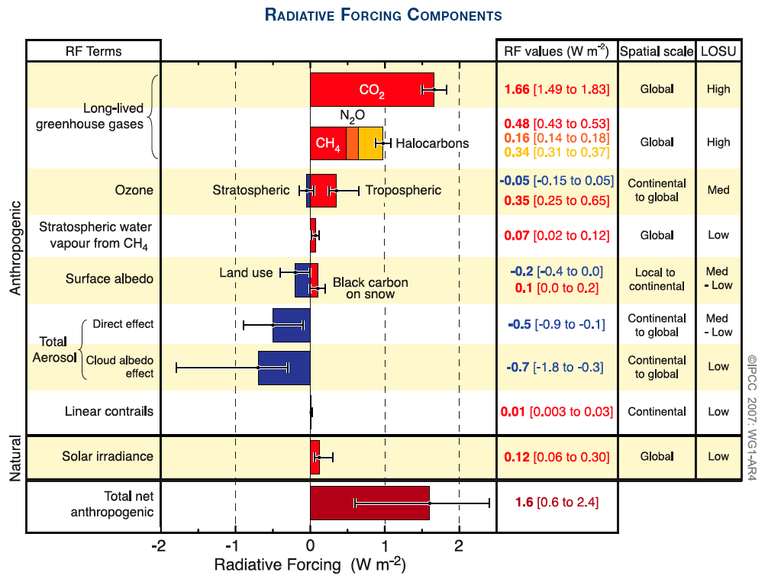 mentions figures from other studies for the radiative forcing (RF) of black carbon, i.e. figures ranging from 0.4 Watts per square meter (W/m²) to 1.2 W/m². A 2013 study by Bond et al. 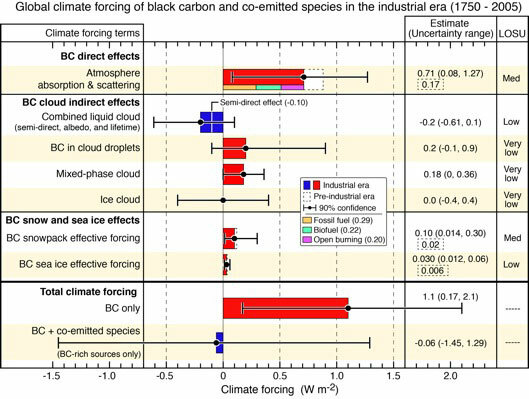 calculates that black carbon has a warming effect of about 1.1 W/m². 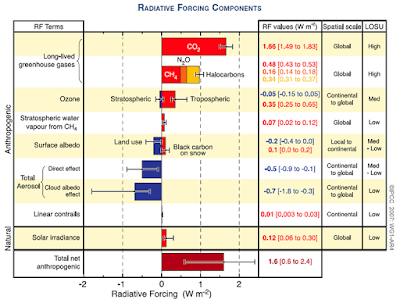 Above image highlights this figure of 1.1 W/m² of radiative forcing (RF), while warning that RF could be as high as 2.1 W/m². In addition to black carbon, sulfur dioxide (SO₂) has an important impact, as discussed in the box below. Some aerosols, particularly sulfur dioxide, have a cooling effect, making that they partly mask the warming effect of other emissions by people. The IPCC AR4 image below shows that the direct and cloud albedo effect of aerosols equals a radiative forcing of as much as -2.7 W/m². In other words, if this masking effect were to fall away, warming would increase by as much as 2.7 W/m², according to IPCC AR4 figures. A 2013 study by Levy et al. concludes that emission reductions by 35%–80% in anthropogenic aerosols and their precursors would result in some 1°C of additional warming. A 2016 paper by Zhang et al. calculates that from 1850 to 2010, anthropogenic aerosols brought about a decrease of about 2.53°C. Also see the study by Rosenberg et al. and the news release. Anthropogenic aerosols are also suppressing the Pacific Decadal Oscillation, making that less heat gets transferred from oceans to the atmosphere. Recent research concludes that future reduction of anthropogenic aerosol emissions, particularly from China, would promote positive Pacific Decadal Oscillation, thus further speeding up warming over the coming years. Dimethyl sulphide emissions from oceans constitute the largest natural source of atmospheric sulphur, and such emissions can decrease with ongoing ocean acidification and climate change. This could particularly impact specific regions such as Antarctica, speeding up warming and loss of sea ice there, as discussed at this paper. 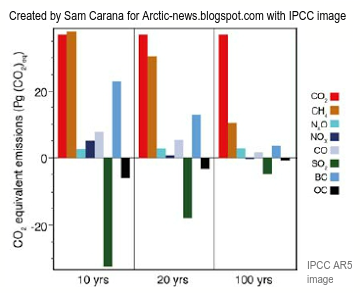 The image on the right pictures the contributions to temperature change by carbon dioxide (CO₂ - red), methane (CH₄ - brown), nitrous oxide (N₂O - light blue), NOx (nitrogen oxides - purple), carbon monoxide (CO - light purple), sulfur dioxide (SO₂ - green), black carbon (BC - blue) and organic carbon (OC - black), over periods of 10 years, 20 years and 100 years. The lifetime of BC, SO₂ and CH₄ is much shorter than the lifetime of CO₂. 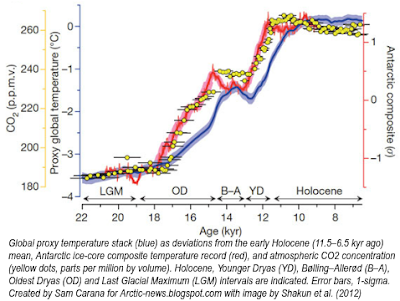 Therefore, the changes by BC, CH₄ and SO₂ to temperature are felt much more strongly when using a shorter timespan. Over a 10-year period, CH₄ produces more warming than CO₂, while BC is not far behind. As discussed in above box, SO₂ partly masks the warming by other emissions by people. For more on the warming impact of methane, also see this page. 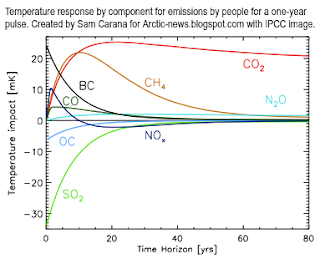 The temperature impact for a one-year pulse of the various emissions by people is depicted on the image on the right. The danger is that this masking effect will fall away, while warming will additionally increase, due to more emissions that have a strong immediate warming effect such as black carbon. 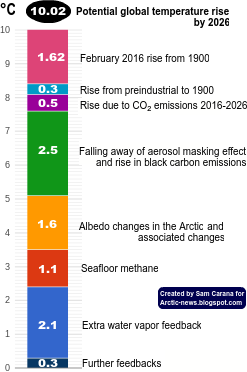 If the masking effect of sulfur dioxide were to fall away, warming would increase by as much as 2.7 W/m², according to IPCC AR4 figures, and even more according to some other studies. Imagine a scenario in which many people stopped burning fossil fuels for energy, including for heating, cooking and lighting. That would be great, but when many of them instead switched to burning biomass in woodburners (stoves, heaters and fireplaces, for heating, preparing food and boiling water) and in open fires, while also burning more forests to create more pasture for grazing, and while burning more waste in the absence of appropriate waste management, the net warming (due to increased black carbon and brown carbon) could be a lot higher, especially when combined with a strong increase in forest fires. Indeed, in the absence of comprehensive and effective government policies, further warming could result as the sulfur masking effect fell away (due to an absence of sulfates that are now co-emitted with fossil fuel burning) and as people started to burn more biomass in woodburners and open fires (instead of using fossil fuel). Waste disposal is another source of aerosols. One study estimates that as much as 29% of global anthropogenic emissions of small particulate matter comes from trash fires. Furthermore, as said, there could be more burning of forests to create more pasture for grazing and as a way to prevent wildfires (backburning and controlled fires), and a further rise in the frequency, intensity, duration and size of wildfires as the weather gets more extreme. 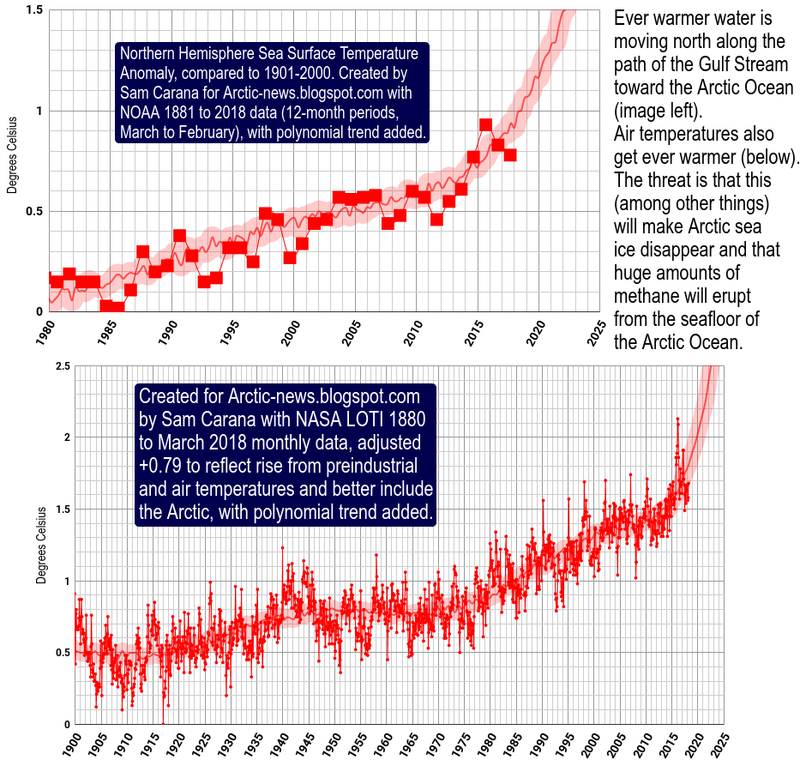 The danger is that, in the absence of appropriate policies, there will be much further warming, due to albedo changes and due to greenhouse gases such as water vapor, carbon dioxide (CO₂), methane (CH₄) and nitrous oxide (N₂O). In regard to aerosols, sulfur has a masking effect (or cooling effect). Reductions in fossil fuel will also reduce the cooling effect that sulfur now has, so this cooling effect will shrink rapidly. The danger is that, at the same time, other emissions will increase that have a huge immediate warming effect, such as black carbon (BC), brown carbon (BrC), carbon monoxide (CO) and nitrogen oxides (NOx), in particular nitric oxide (NO) and nitrogen dioxide (NO₂), jointly resulting in a strong net additional radiative forcing. 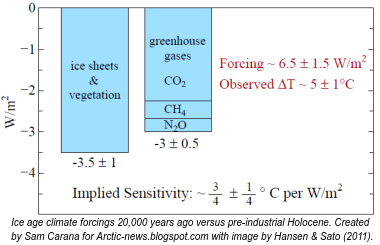 In a recent paper by James Hansen and in an earlier paper by Hansen & Sato (2011), a sensitivity of ¾°C per W/m² is used (see images on the right). Another recent paper suggest that the temperature rise per W/m² could be even stronger. A high-end short-term increase in net radiative forcing, combined with a strong temperature rise per W/m², could therefore cause a temperature rise as a result of changes in aerosols of as much as 2.5°C in a matter of years, as indicated in earlier posts such as this one. The NASA visualization above can be viewed here. The visualization below covers a period from August 2006 to April 2007, showing dust (orange), sea salt (blue), smoke (green), and sulfates (white). 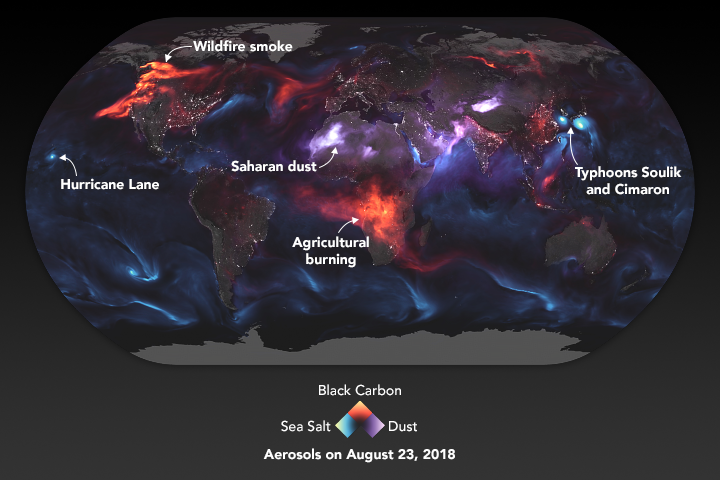 The image below shows smoke from fires on August 23, 2018, together with dust and sea salt aerosols. • Aerosol-driven droplet concentrations dominate coverage and water of oceanic low level clouds, by Daniel Rosenberg et al.